If there's ever a day that should be solely dedicated to telly and finishing off your tins of chocolates it's New Year's Day. 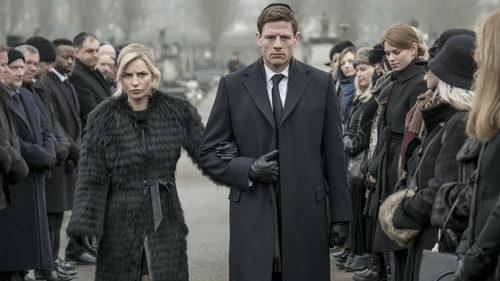 Luckily there's lots to entertain including the highly enjoyable The Second Best Exotic Marigold Hotel, McMafia, a brand new BBC crime thriller that looks very promising and a repeat of the unmissable Blue Planet II finale. If you're a fan of the original Best Exotic Marigold Hotel this sequel is definitely worth a spin on New Year's Day. Hotel owner Sonny (Dev Patel) makes plans to open a second business following his initial success with co-manager Muriel (Maggie Smith). He's also in the process of planning his wedding to Sunaina (Tina Desai) and sets off a series of events when he suspects that Richard Gere's new arrival Guy Chambers is an undercover hotel inspector. Read our review of the film here. David Walliams is bringing his best-selling children's book Grandpa's Great Escape to life with a BBC special. The heartwarming book tells the story of Grandpa, a World War II pilot who has been diagnosed with Alzheimer's disease. When his family can no longer look after him he is moved to an old people's home called Twilight Towers, run by Miss Dandy. It soon becomes clear that Miss Dandy (Jennifer Saunders) is running Twilight Towers for her own ulterior motives, and it's up to Grandpa (Tom Courtenay) and his grandson Jack (Kit Connor) to make a daring escape. Well this looks very promising indeed. The brilliant James Norton (Happy Valley, Black Mirror) heads up this new eight-part crime thriller from the BBC. He will play Alex Godman, the British-born son of an exiled Russian mafia boss. He runs his own finance firm and has been trying to leave his family's shady past and mafia links behind him. However, his straight-and-narrow life will be rocked to the core when he approaches his uncle for help, leading to Alex being caught up in dirty money and dodgy deals. The David Attenborough-narrated documentary series Blue Planet II is about as captivating, awe-inspiring and majestic as television gets. This one-off special - The Future Of The Oceans - follows the team which captured the footage for the series. The special looks back at the Blue Planet crew's journey from the tropical coral reefs to previously unexplored ocean depths and looks at the creatures that appeared on the show. Great British Bake Off presenters Sandi Toksvig and Noel Fielding and judges Paul Hollywood and Prue Leith in the second Christmas special on Channel 4. Former bakers Benjamina Ebuehi, Rob Billington, Rav Bansal and Sandy Docherty make a welcome return to try to impress the judges with their tasty treats. Sure to get the taste-buds watering!